If I were a pasta, I would be this. 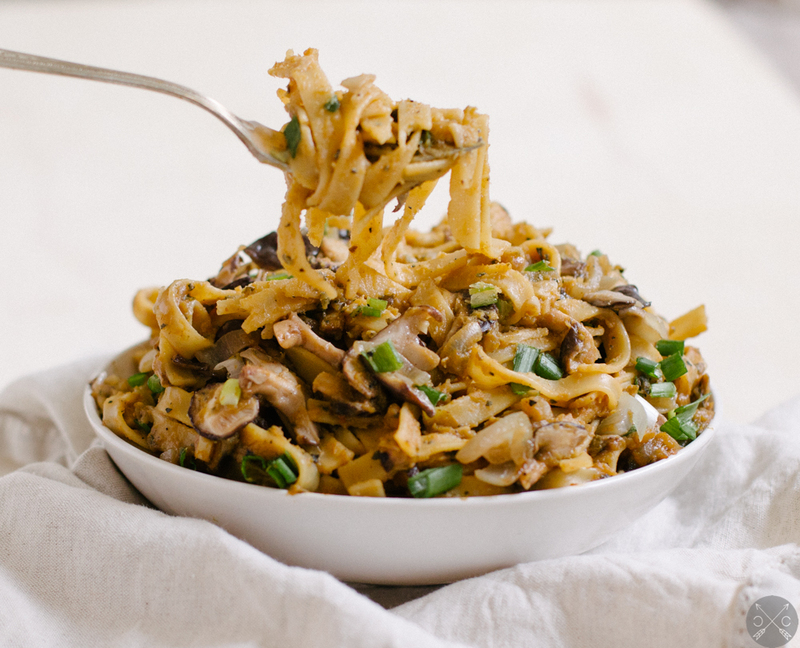 It’s a pasta with Western and Eastern influences, and let’s face it, a little bit of an identity crisis. Much like me, or anyone for that matter, in their 20s. Who am I? Who should I be? What should I be doing with my life? Is he/she the one? What does that emoji mean? All these philosophical questions, all stemming from a bowl of pasta. But I digress. 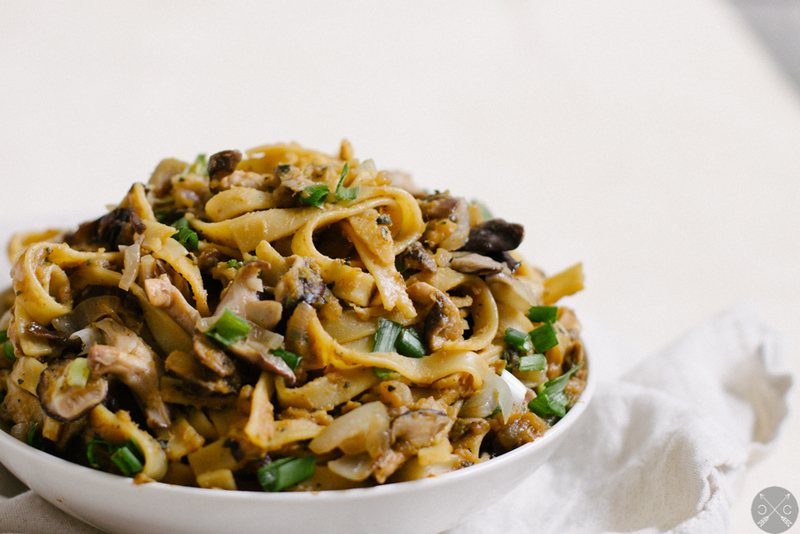 What’s interesting about this dish is that it’s inspired by a classic Italian pasta, but with an Asian makeover. Traditionally carbonara is deliciously rich and filled with creamy cheese, egg, and of course, bacon. While I’m all about that, it’s not necessarily something I want to make as an everyday dish. So, one gloomy Saturday afternoon, I thought about how I could make a pasta where each noodle was coated with a creamy sauce like carbonara, without the impending food coma afterwards. As I stared into my fridge, inspiration struck. That little, half used box of miso was sitting there from the miso-roasted broccoli. Miso… what? Well, gourds. Mainly because whenever I think winter, I think gourds. And so, miso-roasted acorn squash carbonara was created. 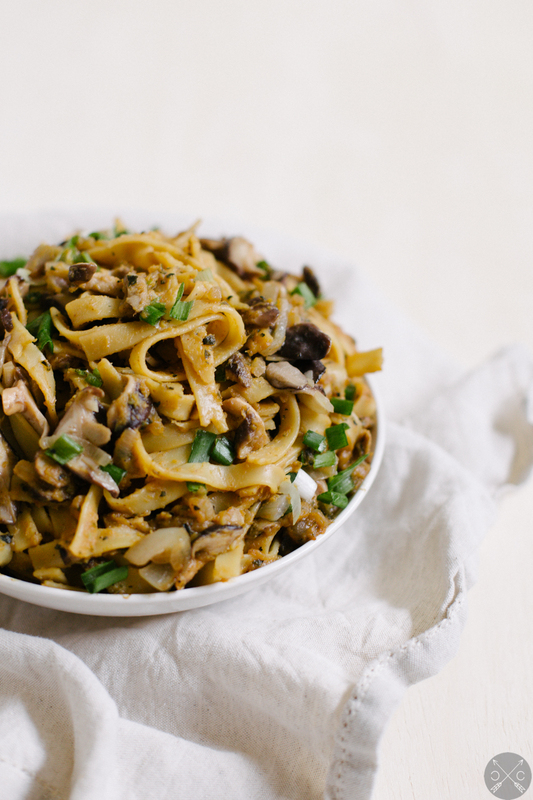 To keep it from being too plain, I threw in some sautèed mushrooms and shallots. 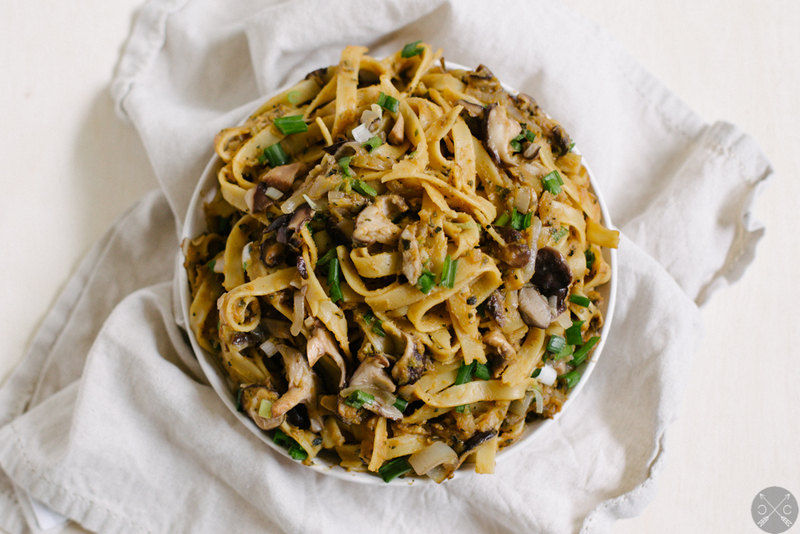 The end result is a hearty yet lighter pasta with strong, underlying umami flavor. Start off by preheating the oven to 425 degrees F. Slice the acorn squash length-wise, making sure each slice is of equal thickness (about 1/2 inch thick). Roast the acorn squash for about 15 minutes— this makes sure that the miso won’t burn by roasting it too early. While the squash is roasting, heat the miso paste, honey, mirin, and cooking wine (but not the sesame oil) on medium low heat in a small saucepan, constantly stirring with a whisk. Heat until the miso paste is dissolved. 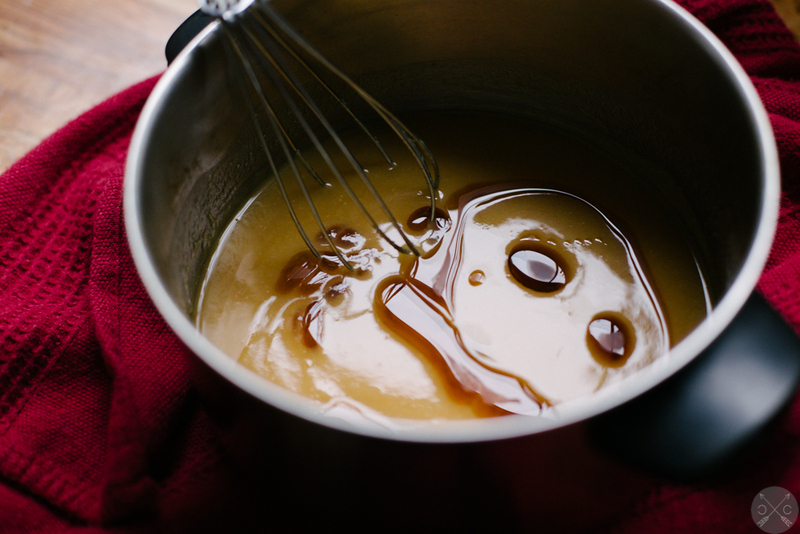 Remove the paste from the stove and swirl in the sesame oil. After 15 minutes of roasting, brush the tops of the squash with the miso, saving half of the mixture for later. 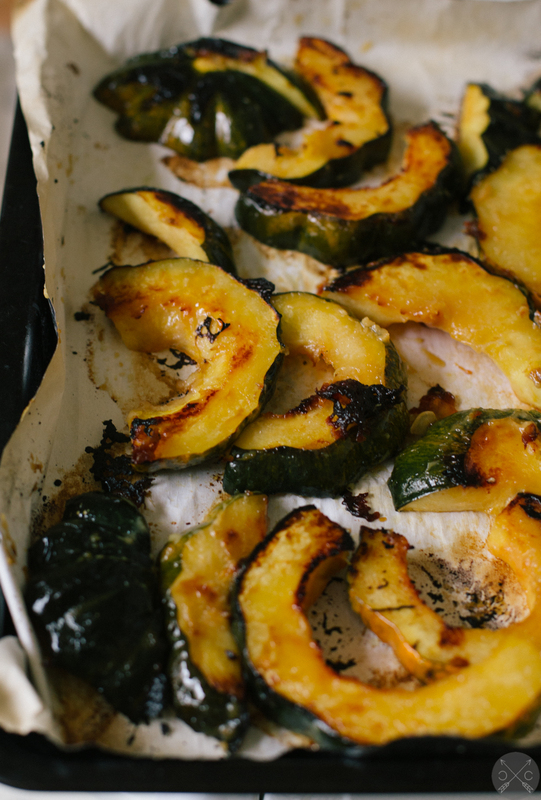 After 15 minutes, flip the squash, brush with miso, and roast for another 15 minutes, or until browned. While the acorn squash cools, sautée the shallots and garlic over medium heat. Add in the mushrooms and a dash of mirin. Cook until mushrooms are lightly browned. Finally, in a food processor, blend the acorn squash and process until smooth. If it’s too thick, add sesame oil in small amounts until it reaches your desired consistency. Prepare the fettucine according to the directions on the box. Toss with squash puree, add in mushrooms and enjoy! this looks SO delicious!! pinned it! O.O i can almost taste it through my screen! Yumm. Can’t wait to try this! Hi mxtu! I pureed it the squash skin on! Correct, toss the pasta with the squash sauce then add in the mushrooms. Will clarify in the steps!